3D printing is fast growing in popularity, and while access to 3D printing may not be that prevalent yet, the interest is definitely there. People have been printing all sorts of things in 3D these days – even chess sets! I don’t think there’s anything cooler – as of now – as what Juliana Meira do Valle and Michael Storey have done. Juliana is a DXArts/Art major and Michael is a Mechanical Engineering major. That is a perfect combination for this kind of project, don’t you think? Basically, they decided to make meal to use as material for 3D printing. With this meal, they printed out, well, bones. How did they do it? They had two recipes for the bone meal. Powdered Bone Meal — 5 parts by weight. 12x Powdered Sugar — 1 part by weight. MaltoDextrin —- 1 part by weight. The other recipe resulted from the fact that they needed something stronger. Powdered Bone Meal — 4-5 parts by weight. UF plastic resin glue — 1 part by weight. The result? Awesomely realistic bones! This project has huge potential in many different aspects. 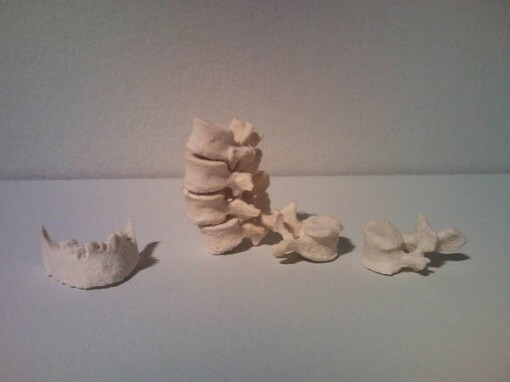 Think about it – if someone can create “real” bone material, then 3D printing can be used for a host of medical purposes! Less critical – perhaps – but no less interesting is printing out entire skeletons for museums and similar purposes! Mark my words, we are going to hear about 3D printing a whole lot more in the months to come. In the meantime, hats off to these two students!